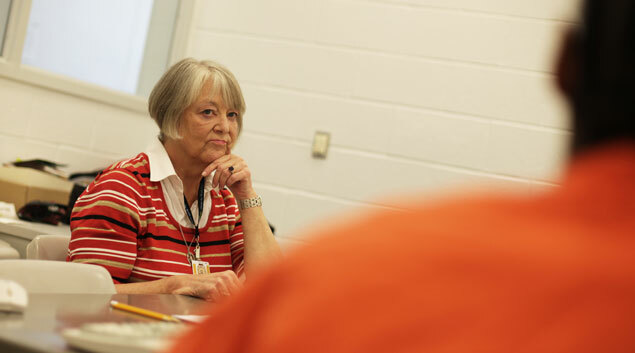 Barbara Saunders teaches a class inside David L. Moss Criminal Justice Center on Dec. 13, 2010 in Tulsa. Saunders teaches the class for Stand in the Gap, a faith-based program with several services, including a biweekly class for women in jail on self-esteem and better decision making. An inmate’s folder is decorated with a religious phrase inside David L. Moss Criminal Justice Center on Dec. 13, 2010 in Tulsa. Photographed during a class by Stand in the Gap, a faith-based program with several services, including a biweekly class for women in jail on self-esteem and better decision making. An inmate’s shoes photographed inside David L. Moss Criminal Justice Center on Dec. 13, 2010 in Tulsa. Photographed during a class by Stand in the Gap, a faith-based program with several services, including a biweekly class for women in jail on self-esteem and better decision making. At the Tulsa County Jail, inmate Soconda Boyd is doing what she can to prepare for her second trip to prison. While waiting for the transfer, she is taking the Women in Transition program offered by Barbara Saunders of Stand in the Gap, which is an interdenominational Tulsa ministry. Boyd is learning about the power of journal writing, setting goals and planning for her release. “What can you do to reward yourself when you meet a goal?” Saunders asks. Saunders suggests goals such as finishing a GED, taking college classes offered in prison, or participating in self-confidence and independence programs. For rewards, she mentions creating art, buying a luxury item like chocolate in the canteen or calling family. “You have to give yourself a gift,” Saunders said. The Tulsa County Jail offers nine educational programs for women, including improving parenting skills, intervening in domestic violence and building self-esteem. A program about budgeting developed by financial columnist Dave Ramsey is being launched this year. The jail had served 3,259 inmates in 25 ongoing classes between Jan. 1 and Dec. 21 in 2010, said Chaplain Mike Hardgrove. Participants include women who are newly arrested, waiting on their case resolution, serving a sentence or waiting on a prison transfer. Federal inmates are not eligible. The jail is not required to offer any programs and does not have a budget for classes. Jail staff will occasionally make copies of course materials, Hardgrove said. Community organizations provide materials, and volunteers gave 4,790 hours last year to staff the programs. The domestic violence intervention programs are always the most popular, followed by the Life in Focus and Women in Transition classes, Hardgrove said. Timing is difficult to coordinate, with some programs running eight to 12 weeks, he said. Because of the staff size, classes are only offered during the day, except for Alcoholics and Narcotics Anonymous sessions. Also, space is limited. The computer lab was turned into a law library to follow federal regulations, which creates an obstacle to offering computer-based classes. Boyd pleaded no contest April 6 to five charges—burglary of a vehicle, assault with a dangerous weapon, malicious injury to property over $2,500, leaving the scene of an accident and violating a protective order. On Oct. 27, she received five years each on the first three charges and one year each on the last two, all running concurrently. Boyd has several prior arrests and convictions going back to 1989, many for larceny. She spoke to the group about learning how to make ends meet. “When I have $100 and it’s mid-month and bills are due, I have to say, ‘OK, I cannot commit a crime to get money.’ There has to be a better solution than that,” Boyd said. The class incorporates how to handle stress while the women are locked up and planning for their eventual release. Each class tackles a different theme, such as addictions, family secrets and shame, conflict resolution, the legacy of trauma, learning self-care, and the power of no.Participants take turns reading out loud, followed by discussion led by written questions. One woman talks about her destructive relationship with her ex-husband, another alludes to being raped and many discuss facing emotional and financial pressures of motherhood. At least two of the four women in the class said their mother had served jail or prison time. Mercedes Love, who has applied for the Women in Recovery alternative sentencing treatment program, said the class has helped shift her priorities. Love has a pending charge from August of robbery with a firearm; she is on a deferred sentence from a May charge of larceny from a retailer and was given a suspended sentence in February 2010 for falsely impersonating another to create liability. She has children who are being cared for by family members.